2016 was a busy year for theatregoers in Japan, and an especially fruitful one for those with an interest in Malaysia. The Kyoto Experiment 2016 (22 Oct – 13 Nov) featured the documentary theatre work, Baling by Mark Teh as its festival opening piece. 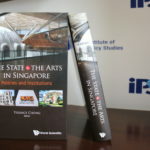 It was produced by Five Arts Centre, one of Malaysia’s most dynamic art collectives and the 2016 recipient of the Praemium Imperiale Grant for Young Artists. Chika Kato’s set for Leow Puay Tin’s ‘Family’, Tokyo, 2016. Photo by Maiko Miyagawa. Festival/Tokyo 2016 (15 Oct – 11 Dec) invited 4 programs under its “Malaysian Focus: Nadirah, directed by Jo Kukathas of Instant Café Theatre (ICT); B.E.D. by Lee Ren Xin; Politiko by Mun Kao and Bondings by ASWARA Faculty of Theatre. Meanwhile, Leow Puay Tin’s Family (1996), was presented by the Asian Women Performing Arts (AWPA, or Ajokai) from 16 – 18 Dec, also in Tokyo. 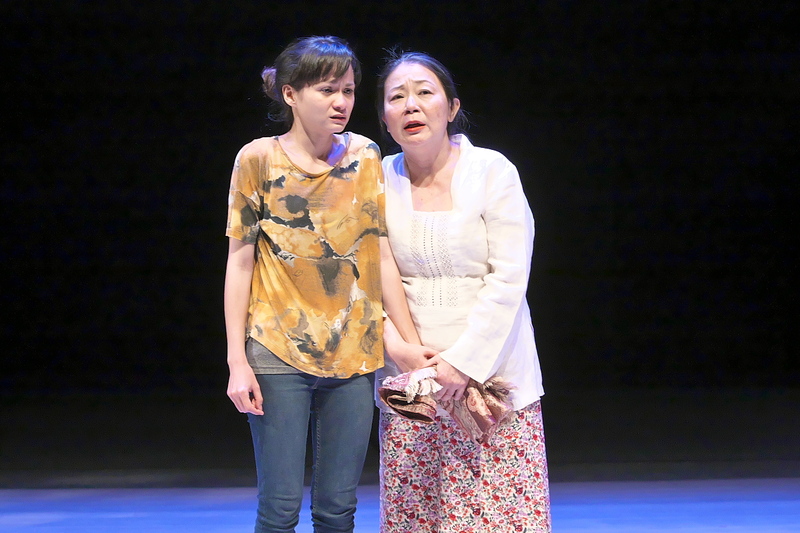 Sharifah Amani as Nadirah, in an emotional scene with Neo Swee Lin, who plays her mother in ‘Nadirah’ by Alfian Sa’at, Tokyo, 2016. 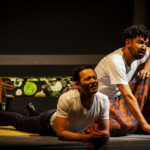 Nadirah is the work of Singaporean playwright, Alfian Sa’at and is set in Singapore, but the issues of religion, the state and family in the play resonate across the two countries. Nadirah, and Leow’s Family (another play with a Malaysia-Singapore genealogy) had intriguing contrasts with each other. Nadirah, is a story of interfaith understanding in an ordinary family in Singapore. 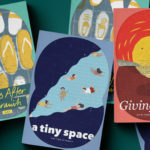 Inspired by Yasumin Ahmad’s film Muallaf (2008), the story revolves around a university student, Nadirah, her friends, and her Mulim-convert mother who wishes to start a new chapter of life with a man of a different faith. It was first staged in Singapore in 2011, then in Kuala Lumpur in 2012. 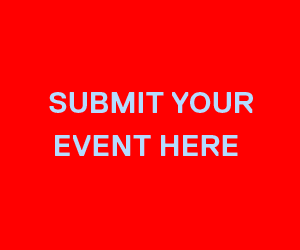 Festival/Tokyo’s version marked the first appearance outside of the Southeast Asian region. The house was filled to the brim with an audience of not only theatre fans but also film lovers, as the cast in Tokyo included well-know film stars, Sharifah Amani as Nadirah and Iedil Putra as Farouk. Sharifah impressively embodied the internal conflict of her heart understanding her mother’s position, despite her inability to accept her decision. She successfully portrayed that above all, the character couldn’t escape the feeling that her mother was abandoning her. Being brought outside of the original context, Nadirah seemed to have conveyed very different messages in Tokyo. At a production in Kuala Lumpur, which I saw in 2012, Nadirah was a story that was close to the local audience’s hearts, and contained some parts that were especially hard to talk about in the local context. The theatre was filled with laughter and everyone felt connected to the story. However, in Tokyo, it was inevitable that it meant telling the story of others to the local, largely Japanese audience. The topic of interfaith issues is certainly an unfamiliar concept in Japan. The crowd was much quieter and serious, although they were very engaged and enthusiastic. One of the audience members, who spoke to the director after the show, said that she really enjoyed it but she was full of emotions and had a lot to digest. Mother and daughter in prayer, ‘Nadirah’ by Alfian Saat. Leow Puay Tin’s Family, which celebrated its 20th Anniversary last year, also reflected conflict of values and faith. The project was a co-production with Leow and Asian Woman in Performing Arts (Ajokai). It tells the life story of Mrs. Yang, a migrant from China to Singapore, who rebuilt her life from the hardship of losing a husband and all her sons, to a prosperous family enterprise, together with a daughter and daughters-in-law. The original script consisted of a collective of “modules”, or short scenes, episodes and songs, and it is left to the director to use these modules to structure a performance. For this reason Family appeared quite differently each time it was performed. 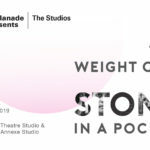 When TheatreWorks first presented it in 1996, director Ong Keng Sen decided that the audience would randomly chose the texts with each performance. 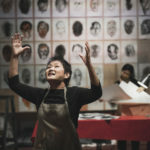 Two years after a successful show in Singapore, Five Arts Centre’s Krishen Jit and Wong Hoy Cheong co-directed Family in Kuala Lumpur, as a form of visual performance, utilizing an abandoned colonial mansion house as a venue that allowed multiple scenes to be performed simultaneously, as the audience walked about. Leow Puay Tin’s ‘Family’, Tokyo, 2016. Photo by Maiko Miyagawa. Compared to these two earliest versions alone, it is fair to say that the director for the Tokyo production, Hiroko Takai, decided to take a rather conventional form, by placing the performance inside the black box as a one-piece theater production. The show was structured as a series of Mrs. Yang’s memories on her deathbed, but Takai created additional stories of a typical Japanese family that were set in several different generations based on the script translated by Keiko Tsuneda. To localize the production, subtle links to the Yang family in Singapore were carefully inserted into the new part; a father brings back kuih as a souvenir from colleague, or the younger sister seeking job opportunity for Yang’s company that had expanded its business to Japan. The director also paid homage to a most famous family in Japan in this process – the Isonos from a beloved old Japanese cartoon. Parallel to the various periods of Mrs. Yang’s life history, each version of the Isono family’s humorous episodes functioned as a bridge between the original stories to Japanese audiences. Apart from the new script, the Japanese version of Family was a luxury showcase of some of Japan’s top creative talent. An astonishing projection by visual director Keisuke Takahashi mapped over the stage set, stage floor and sometimes even to the bodies of the cast. 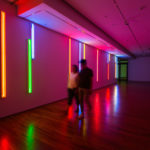 This, and the abstract and vigorous movements choreographed by Mikuni Yanaihara, helped audiences jump between the scenes, time, and the two countries. It was also remarkable that 5 skillful actors, 2 male and 3 female, performed this voluminous script with almost 30 characters without a hint of disruption. Simple but well-designed stage costumes by Yosuke Tanaka also played a big part in distinguishing the characters. Keisuke Takahashi’s projections in Leow Puay Tin’s ‘Family’, Tokyo, 2016. Photo by Maiko Miyagawa. Chika Kato took the challenge of designing sets for the story spanning almost 100 years. 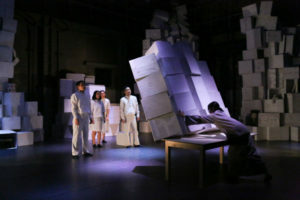 White-painted boxes piled up as high as the ceiling of the theatre did not only passively shaped the background, but took an active role in the story. While functioning as multiple screens for the projection, actors moved the boxes from one pile to the other mindlessly, or built a high wall covering the whole stage front, only to collapse them as Mrs. Yang moaned in despair. The lighting designer Masayo Okada mobilized her full experience not only to coexist but contribute greatly to this highly ambitious production. The stage was a product of a highly professional and highly creative team that certainly gave Family a new life. Lighting design by Masayo Okada in Leow Puay Tin’s ‘Family’, Tokyo, 2016. Photo by Maiko Miyagawa. While Nadirah explicitly talked about interfaith issues between family and friends, the Japanese version of Family by the AWPA only talked about life and death, keeping the religious aspect strictly implicit. In fact many in Japan find it uncomfortable to talk about faith at all.Therefore I feel that Festival/Tokyo’s decision to stage Nadirah in the official program under its Malaysian Focus, despite it being a the story being set in Singapore, reflects the festival’s determination to question the status quo and not only show ‘comfortable’ productions. The divide between the show and the audiences may have been deep. However, so was the impact on most of the people who had a chance to witness it. It was also probably because of this awkwardness that the Japanese version of Family seemed to omit religious elements from the script. In the process of bringing the story closer to Japanese audiences, scenes such as the grandchildren discussing Christianity with Buddhist family members, or a detail about Mrs. Yang praying for Kuan Yin with her incense and chants learned from a monk, are almost thoroughly cut out from the Tokyo version. Leading actress Mizuki Nishiyama as Mrs. Yang in Leow Puay Tin’s ‘Family’, Tokyo, 2016. Photo by Maiko Miyagawa. Although the structure of the script insinuates the cycle of rebirth through the character’s life and death, a concept very familiar within Japanese society, it seems that the lines that indicate religious tenets such as hell, liberation from the cycle, or Mrs. Yang’s desperate call for help to Kuan Yin, have all been consciously removed. Tales of Isono’s family, used to make the play more relatable to Japanese audiences, likewise did not exhibit even a slight hint of religion. The topic of faith is no less easy in Singapore or Malaysia than it is in Japan, especially when the matter stretches beyond private and public life. However, in the case of modern Japanese society, we must start admitting that one can have faith, and it is okay to talk about it. Precisely because the production of Family was highly creative and compelling, I sincerely hope there will be a chance for the team to talk about this uncomfortableness of speaking about faith if given the opportunity to re-stage. L-R: Iedil Putra, Sharifah Amani and Farah Rani in Alfian Sa’at’s ‘Nadirah’, Tokyo, 2016. 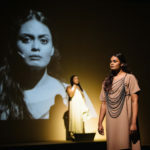 At the post performance talk of Nadirah, director Jo Kukathas said that she is determined to keep the dialogue open especially because she feels that in this world now, people tend to reject others than trying to accept them. It is far easier to dismiss or denounce differences in faith and values, than having the patience or desire to understand them. Even while making earnest attempts at understanding, sometimes we subconsciously avoid facing these differences. Sometimes facing these differences means challenging your own values. The conflict is even more difficult when it is with people close to your heart, or when it seems impossible to bridge the gap, but we must face the discomfort. Good news is, we at least have these great stories to prepare our heart for the challenges ahead. Nadirah was staged at Nishi-Sugamo Arts Factory from 11-13 November 2016. Family was staged at Morishita Studio from 16-18 December 2016. Mio Yachita is a researcher and practitioner in cultural policy, performing arts, and international cultural relations. Before joining Tokyo University of the Arts, she had served as a head of arts at the Japan Foundation, Kuala Lumpur. These are commendable plays. I have watched one of them, the one staged two years ago in KL. I also respect the Japanese attitude towards religion, which is all-embracing and thus mostly free of the conflicts experienced by people in other cultures. To put it simply, they do not ‘make a big fuss’of religion, having learnt painful lessons from their own history of blind worship leading to extremism.